Digging up a new way of living. It is currently available on iPads everywhere in the Newsstand app. We have interviews from Paul Gautschi on his amazing Back to Eden garden. Larry Hall talks to us about the Rain Gutter Automatic Watering System he created. Baker Creek Heirloom Seeds comes to you via the voice of Jere Gettle. A personality local to me, Gretchen Anderson answers some of our questions about starting backyard chickens. If chickens are not for you maybe our discussion with Vice President of Mann Lake Ltd may interest you. Jack Thomas gives us great advice on the topic of becoming a bee keeper. If you want to know anything about real world emergency preparedness then you will want to catch Steven Harris‘ interview. He tells us what every home can do to take a first (and easy) step toward counting on yourself in a power outage or if you lose a regular water supply. We even have a special article contributed to us from Pepper Miller. Her 3 part blog article “The Chicken Plan” is an example for you to see how one person put her wish to keep chickens into practice. We are thrilled about the launch of the magazine but we are always looking forward to new issues. We are building June’s magazine right now and would love your participation. It can be as simple as a picture. You can send us pictures of your Breaking Urban Ground Projects. They can fall into these major categories. Show us your chickens, bees, rabbits, worms(worm compost projects) goats and others. Battery storage, home wind generator, solar projects, rain storage. Any utility you provide for yourself. Canning successes, canning failures, dehydrated foods, cheese making, syrup, yogurt. What food did you make? Your urban garden, community gardens you participate in, Veggies you grew or are growing, unusual crops, your first plant. If it is growing for food we want to see pictures. Planter projects, a trellis you made, detergent, candles, beeswax lip balm, a bat house. This is the “construction zone”. This is more of an action than a “thing” so let’s see first aid kits, group pictures of your CPR certification class, your 72 hour kit. Send photos related to “being” ready for lives turbulent situations. How do you maximize your space. Lets see creative ways to manage what you have. Shelves you built, basement root cellars, serious spice cabinets. Don’t forget to tell us about the picture. A picture of canned carrots is nice but information on who made them and a little background is better. With all of this be sure to include the kids. Breaking Urban Ground includes all people learning to provide for themselves as they have interest. The entire family can be included. My kids don’t like gardening but love to make cheese. If your kids like doing something send pictures of their projects too. We are all about learning. Learning includes mess-ups and failures. Send pictures of these and some info on what you learned from the experience and what you will do differently next time. Sending your photos to Ideas@BreakingUrbanGround.com constitutes permission to use or not use the photos in future issue and articles and on the Breaking Urban Ground website and social media affiliations. Don’t send us pictures if they are not your own or you do not have authorization to distribute them. Our first issue was so much fun to make. Lets make the next one better. Here is a great idea for your herb garden. 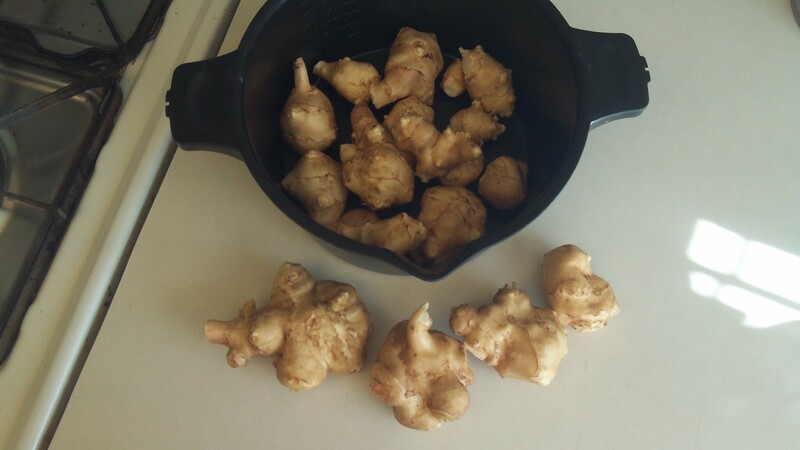 Buy a hunk o’ ginger root (which is really a rhizome), plant it this spring, harvest it this fall and freeze in 1 inch chunks so you have ginger year round. We’re totally going to try it. Lovely foliage and food at the same time. Plus it gives me a reason to make homemade Ginger Ale. Jerusalem Artichokes. If you can grow weeds you can grow these. 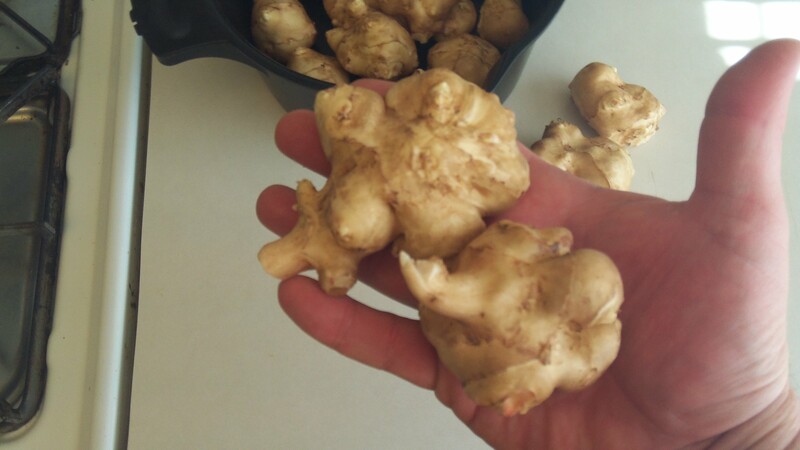 Jerusalem Artichokes, also known as Sunchokes (or fartichokes) are not artichokes and they are not from Jerusalem. They are a root that tastes like an artichoke heart but they are in the sunflower family. The moniker “Jerusalem” has most likely evolved from the Italian word Girasol meaning flower of the sun. They are a very hearty plant growing in any soil with almost any amount of water in any level of sun. I know this because I tried it. I planted about 14 of the tubers in the part of my yard that gets the least sun. I made no amendments to the dirt that is there. I gave them no water other than some over spray from a near-by part of my lawn (keep in mind that this section of lawn is also shaded and gets little water as it is). I literally placed them in a 4 inch deep hole, packed dirt over them and let them be. For months. And months. Buried alive in neglected dirt. What I got was a long thin plant that grew like Jacks bean stalk up the side of my house. When it grew into the crux of my wall and roof I pulled them around the edge of the roof and let them continue up. They grew small (for a sunflower family plant) flowers and ended the season at about 12 feet tall. Then fall came and they turned brown. Then just before winter I cut them off about 1 foot tall and left them there through the snow and freezing weather. 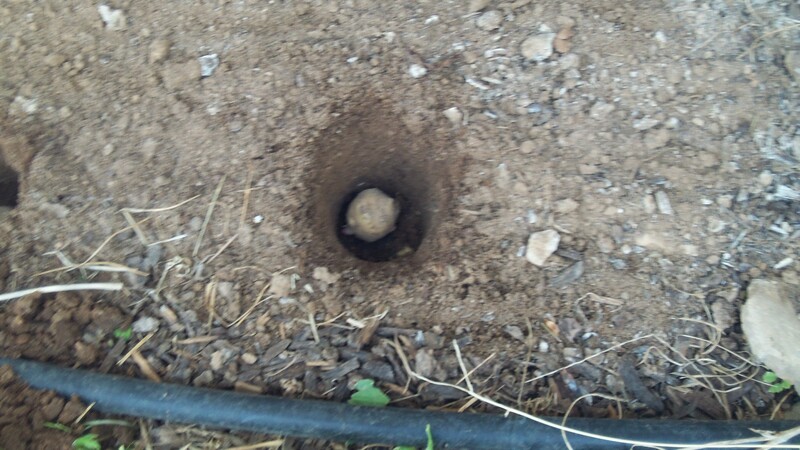 When I went out the other day and lifted one out of the dirt I was able to harvest what you see in the picture below. They are edible and quite tasty and recipes abound ranging from eating them raw to delicately prepared dishes that are fit for royalty. They are so easy to grow that there is no excuse not to if your typical excuse is time or skill. Even the most herbacidal maniac with a square foot of earth can grow one. Because less is better and natural is best. Growing woodland/pasture raised Large Black Hogs, cows, heritage chickens, veggies, maple syrup, honey, making natural soaps, sugar scrubs, lip balms & herbal salves. Our farm provides our family & yours with the best food under the sun. We let our animals grow at the pace nature intended, with no hormones, antibiotics or pesticides.